La dott.ssa Maria Silva (a sin. ), funzionaria della Sezione Consolare dell’ambasciata di Capo Verde a Roma, con i volontari di agosto: (da sin. 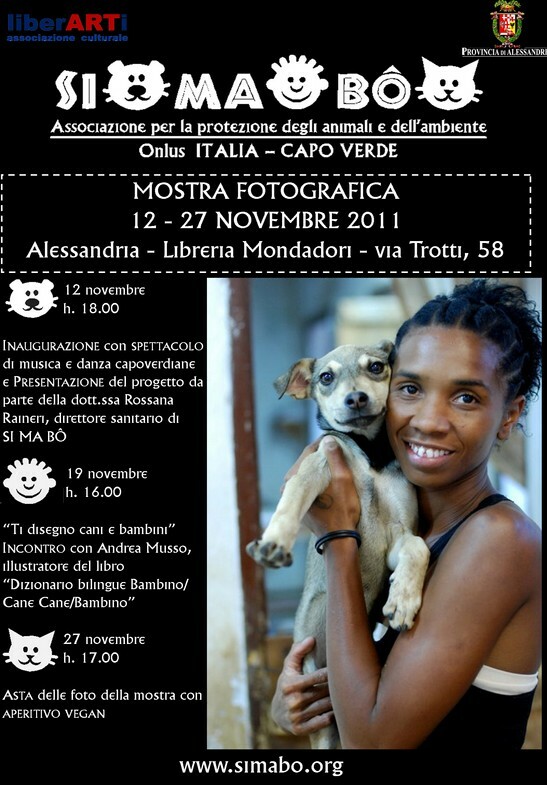 a destra) Marta Mauri, studentessa al 4° anno di veterinaria a Milano, Giulia Bellantuono, veterinaria neolaureata di Fano, Paolo Viola, studente di veterinaria al 4° anno a Milano, Anita Dragoni, arpista e insegnante di musica, e (in basso) Andrea Bonomi, ispettore Casagit. È stato con grande piacere che qualche giorno fa abbiamo ricevuto la visita della dott.ssa Maria Silva, la funzionaria della Sezione Consolare dell’ambasciata di Capo Verde a Roma, che prepara i visti gratuiti per i nostri volontari. In effetti mi sono sentita un po’ a disagio quando a luglio ho fatto domanda per tutti quei visti per l’estate. Ho pensato: “Magari sono troppi, non ci crede nessuno che vengono tutti a lavorare nel mese di agosto…” Invece ce li hanno dati tutti, dimostrando ancora una volta grande fiducia nel nostro operato, cosa di cui siamo molto riconoscenti (e anche un po’ orgogliosi…). E naturalmente è stata grande la mia soddisfazione quando, il giorno della sua visita, del tutto a sorpresa, la dott.ssa Silva ha potuto constatare che tutti e cinque i volontari per cui aveva emesso il visto si trovavano effettivamente in sede a lavorare! Nonostante il caldo torrido e la vicinanza della spiaggia, non ne mancava nemmeno uno! Grandi ragazzi! 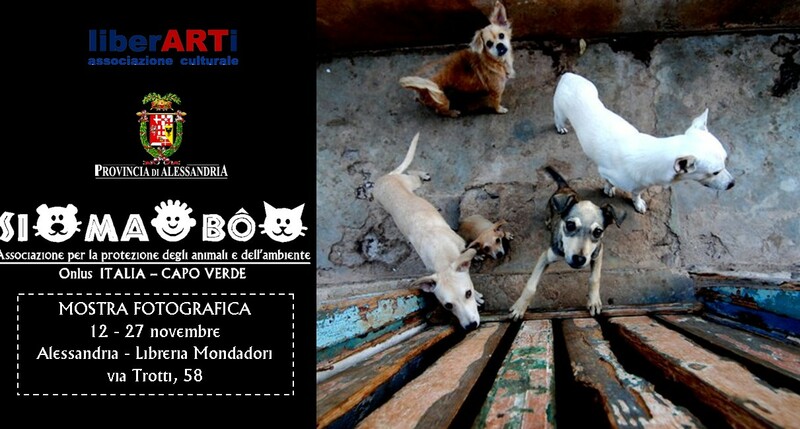 E grazie ancora all’Ambasciata di Capo Verde a Roma per il sostegno fornito! As the plane touched down at Sao Pedro Airport, my fellow passengers applauded enthusiastically. I wondered if they knew something that I didn’t. The usual scramble for bags and coats followed as we shuffled towards each end of the plane and waited for the cabin crew to open the doors. 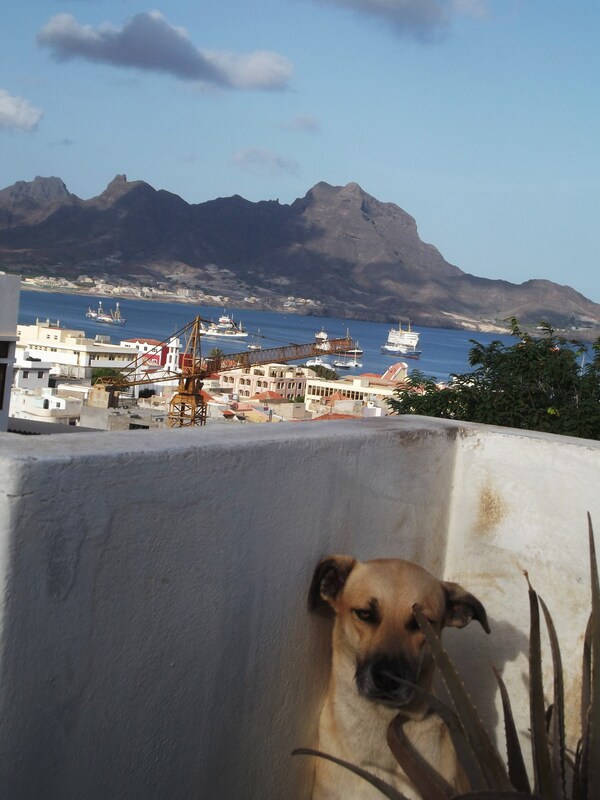 Before I had even reached the top of the steps, I was enveloped by the fresh and relaxing sea breeze, a feature of the Cape Verdean climate on which I was later to become reliant to maintain my long, daily dog walking duties in the hot African sun. The small airport handles only one plane at a time so, despite joining the wrong queue to buy my visa, I was through immigration and baggage collection in less than an hour. SI MA BO had arranged for a driver to pick me up so I was soon on my way to my next non-veterinary volunteering experience. View of Mindelo from The Terrace. 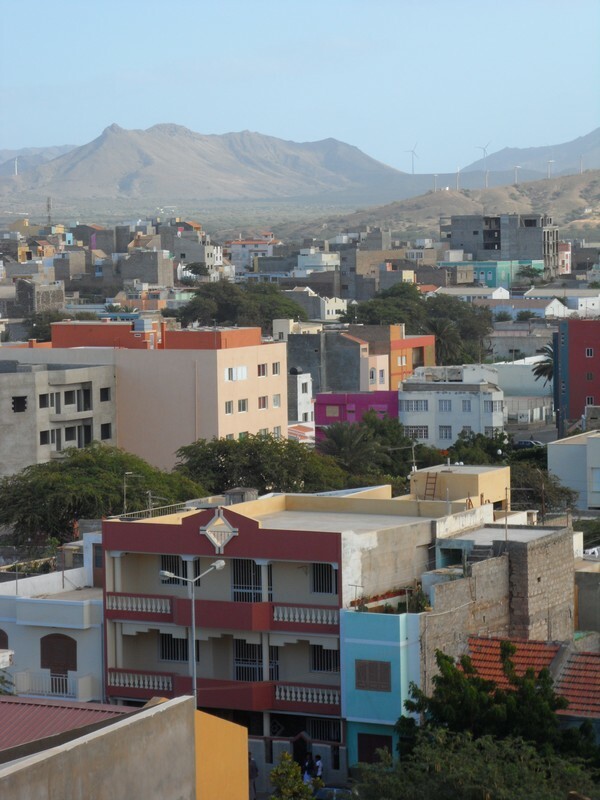 The house in the foreground happens to be Cesaria Evora's house, the most famous Capeverdean singer who died in Paris on the 17th of December last year, and for whom there has been public funeral during my stay in Mindelo. 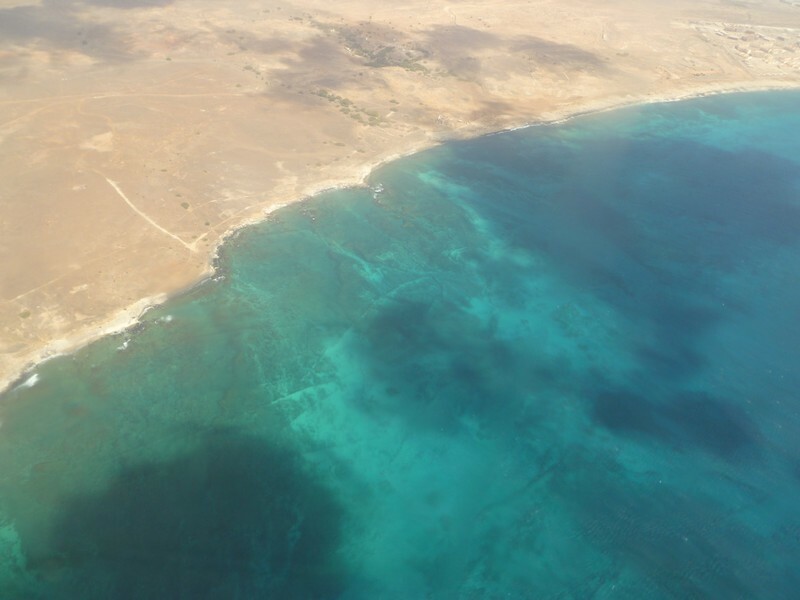 The wide, modern airport road and barren, hilly landscape soon gave way to the bustling town of Mindelo. In the centre, its tidy, colourful homes not dissimilar to huge Lego bricks are set among some beautiful old colonial buildings in cobbled streets. The driver dropped me off at La Terrazza, the home and office of the SI MA BO founders and the base for most volunteers. 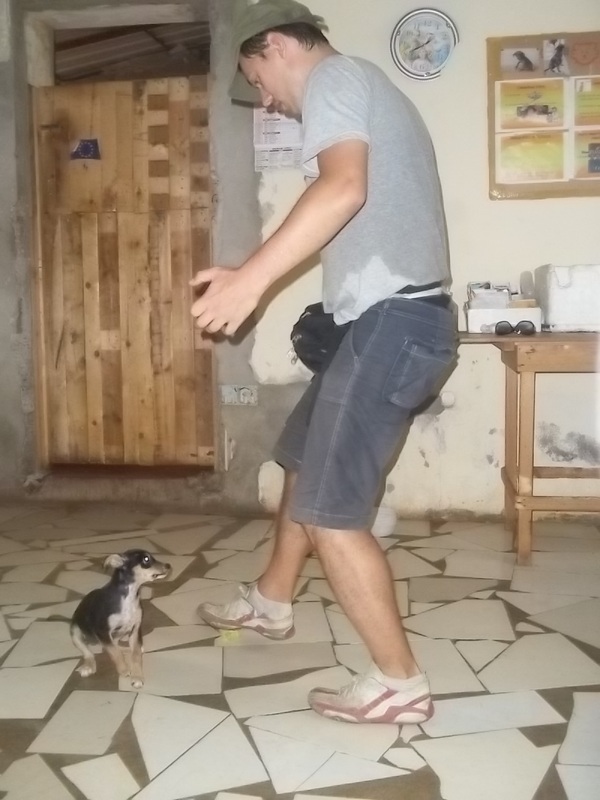 Paolo greeted me warmly and introduced me to Orestis, a charming young Greek volunteer veterinary surgeon who had been in Mindelo for a month, single-handedly neutering dozens of cats and dogs following a successful local campaign. Orestis Dizoglidis, the Greek surgeon volunteering at SIMABO in November, with dona Nanda, the local "nurse" in charge of the clinic. After a quick tour of the house, Paolo introduced me to the cats and kittens – nearly thirty of them. One by one, I said hello and stroked those that would allow me. Most were completely indifferent, a few hid under the table, a few came back for more but one reared up on his hind quarters and hissed at me so forcefully that I retreated quickly . He was just a tiny black and white baby, small enough to fit into an espresso cup. He had attitude with a capital A so I nicknamed him The Espresso Monster and resolved that we would be friends by the time I left Mindelo. Espresso Monster (on the left) with his brother Ginger Baby and his sister Tarta Piccola. They were abandoned at SIMABO together with their incredible mother when they were a couple of hours old... 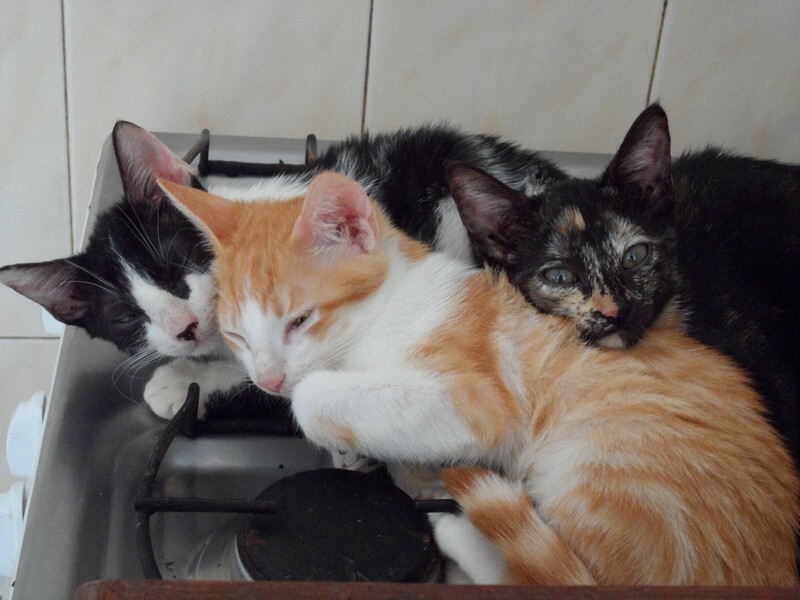 They like to sleep on the warm oven where the surgical cloths are sterilized. One of the kittens that came back for more was an astonishingly beautiful little silver tabby and white boy called Feo. He looked upon me as an opportunity for all things pleasurable. If I sat down, he would jump on my lap; if I opened my suitcase, he would dive into it; if I brushed my teeth, he would leap into the basin and, if I lay on my bed, he would crawl up onto my chest. He was never happier than when being scooped up for a cuddle and carried around the house – in fact, he insisted on it. Feo’s trust and affection was extremely endearing and rather surprising given his start in life. He was one of three kittens living in the garden of a house that is let to tourists. An animal-loving couple took pity on the kittens and began feeding them but, to their horror, woke one morning to find that one had met a grisly end. They took the remaining two kittens inside and began making enquiries locally about an animal rescue centre. 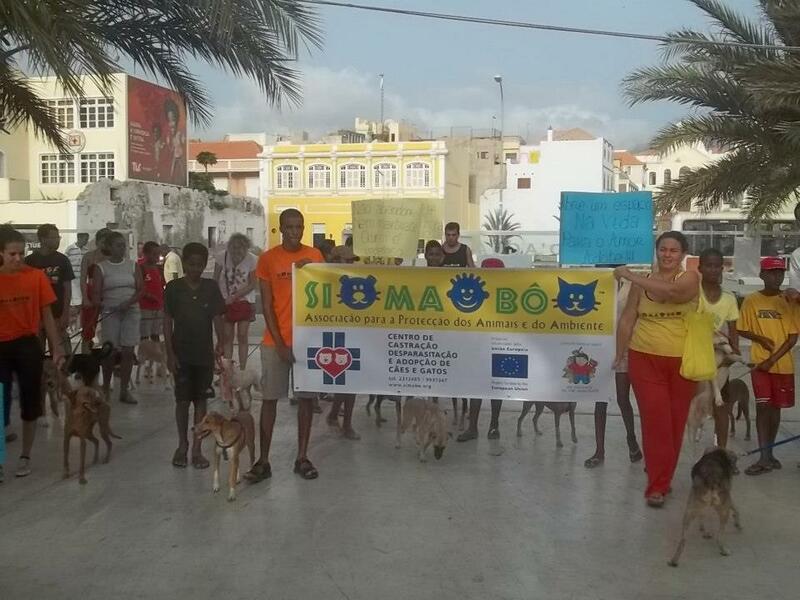 Being the only such organisation on the island of Sao Vicente, they were directed to SI MA BO and the two kittens, later named Feo and Cabo Verde, joined the feline residents in the La Terrazza household. 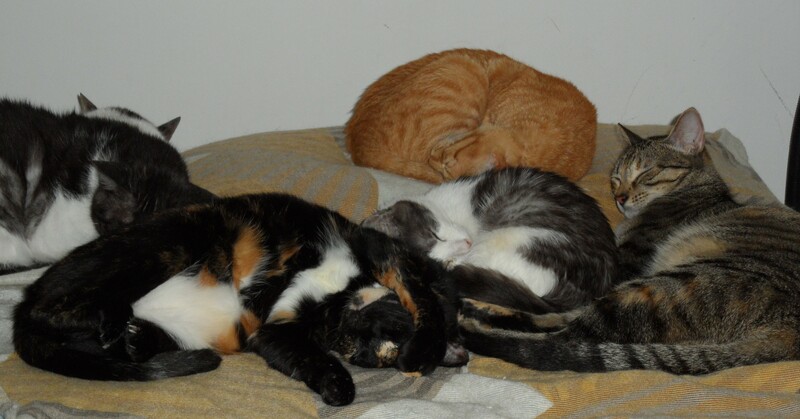 Some of the 28 cats of the Terrace on my bed. It was a lot of work when some of them caught a bad flue! Feo’s good luck did not end there. 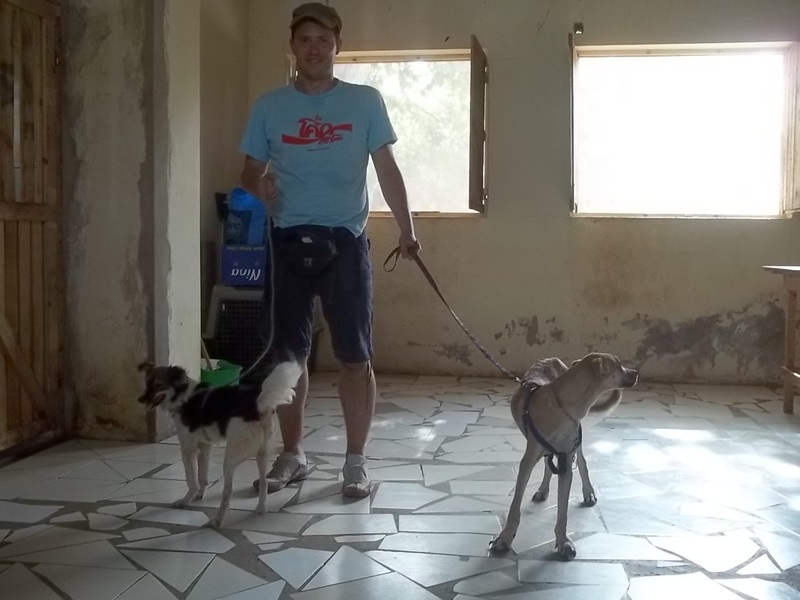 The couple who rescued him and Cabo Verde not only offered to adopt them both but they also became supporters of SI MA BO. 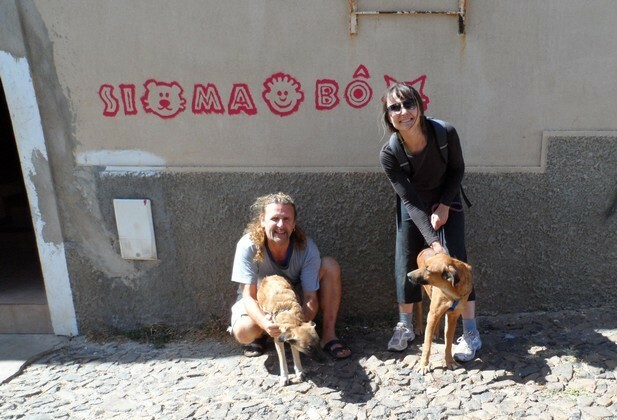 The wheels were subsequently set in motion for the long process of preparing the kittens to fulfill the Italian government’s pet entry requirements – the first foreign adoptions for SI MA BO. 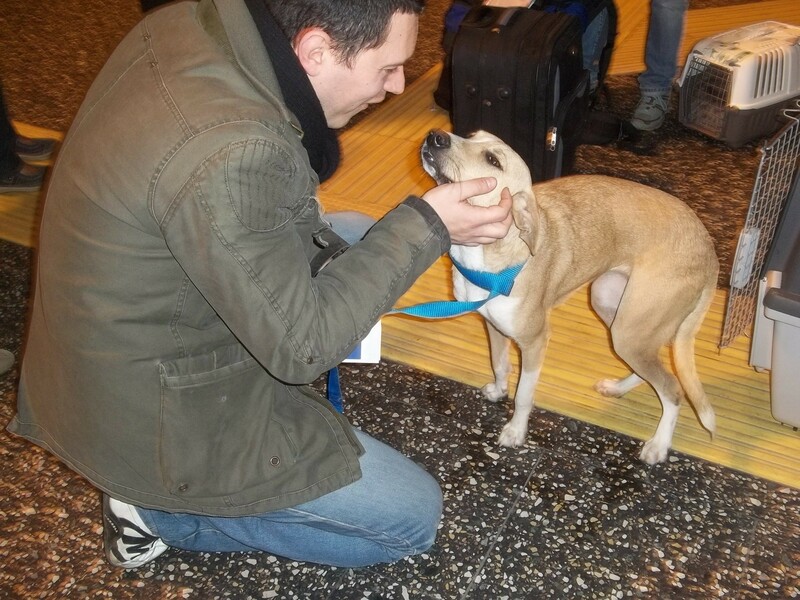 The beautiful Cabo Verde, now waiting for his blod being tested for entering the Italian territory to reach his new family together with Feo. The only time I ever heard Feo complain was when his microchip was inserted. At all other times, his sole objectives were pleasure and companionship. 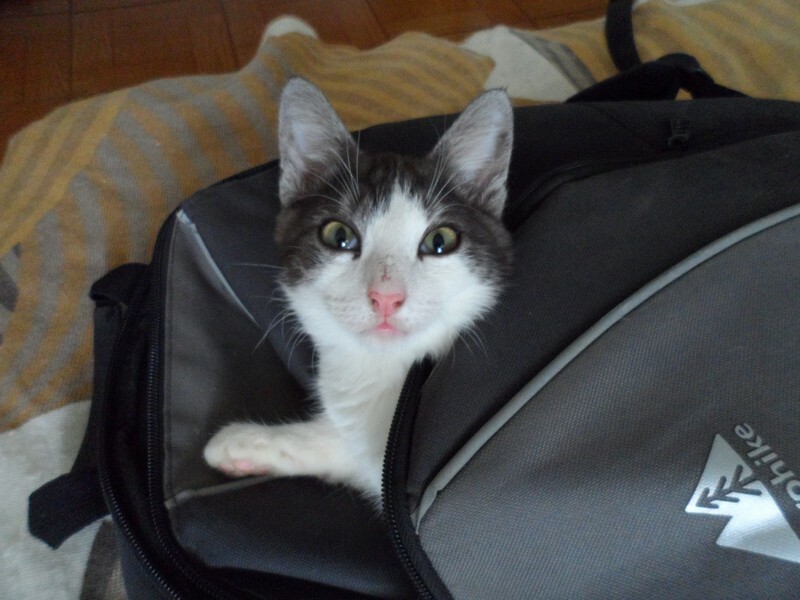 He was growing into such an in-your-face young cat that I once jokingly told visitors that Italy was welcome to him. How I regretted saying those words in jest when, towards the end of my volunteering trip, Feo developed a serious respiratory infection. As he hid under the bed with a bunged-up eye and severe congestion, I willed him to get well and tried unsuccessfully to coax him out of his hiding place. He was so unwell that, for a couple of days, I put off going to bed each night least I woke in the morning to find that he had passed away. I needn’t have worried, though, as Feo’s good luck continued unabated. 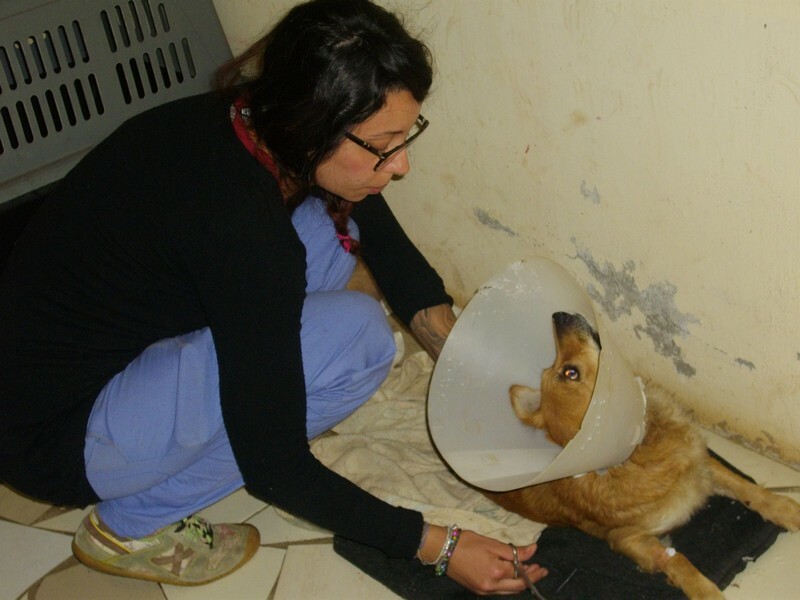 Martina, a lovely young Italian volunteer veterinary arrived at La Terrazza in the nick of time and began his treatment regime immediately. 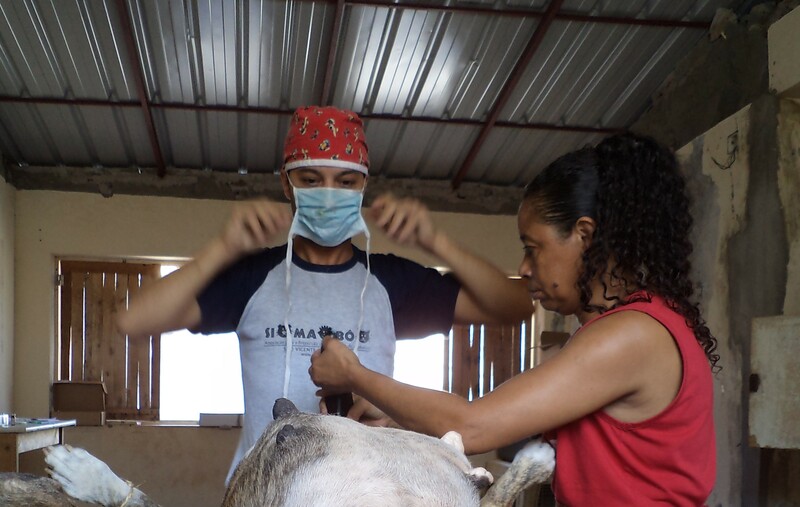 Thankfully, Feo recovered fully but not before Cabo Verde and the other kittens developed the same respiratory problems and also required Martina’s veterinary expertise. 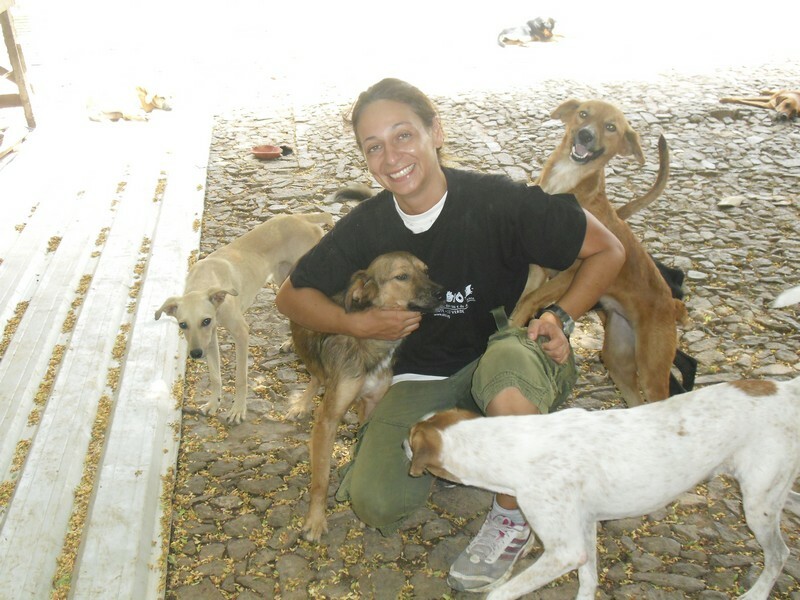 Martina, the Italian vet who arrived at SIMABO a couple of days before my departure and took care of Feo and the other cats who had caught a bad flue, as well as of the many ill and weak dogs at the shelter. 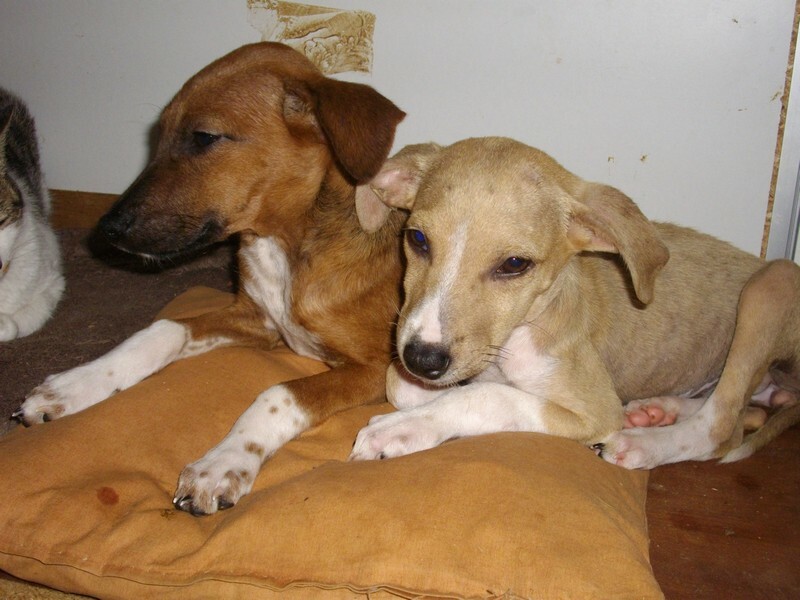 Any day now, Feo and Cabo Verde will be flying out to begin their new life in Italy. I have a funny feeling that Feo is special and that somebody, somewhere, is looking after him. Not all cats and dogs are blessed with Feo’s luck. 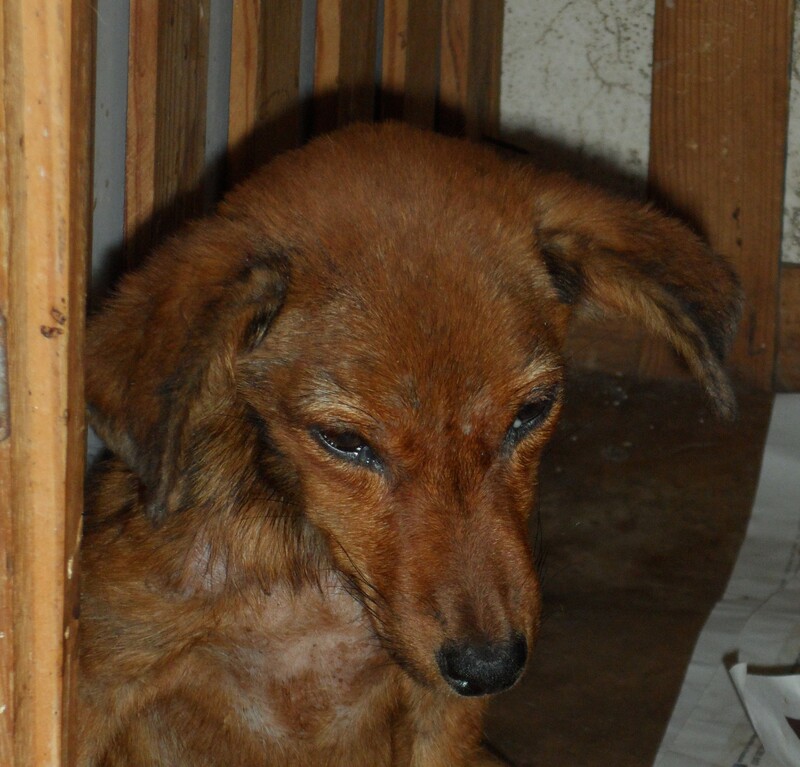 In the second week of my volunteering, an exquisite little dog was brought in to the shelter for rehoming. Her name was Honey and she was just two years old. Her daddy was moving away and, sadly, was unable to take her with him. 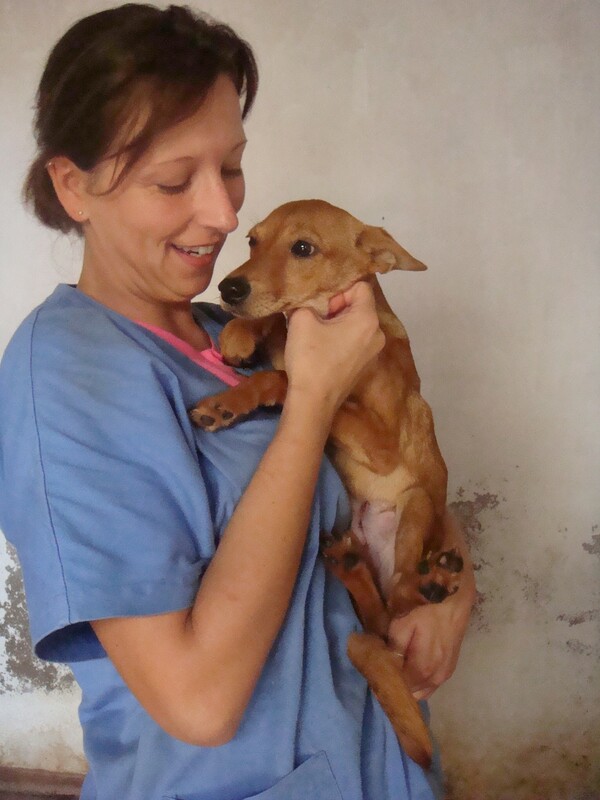 Paolo assured me that such a small and beautiful dog would be adopted within one or two weeks. 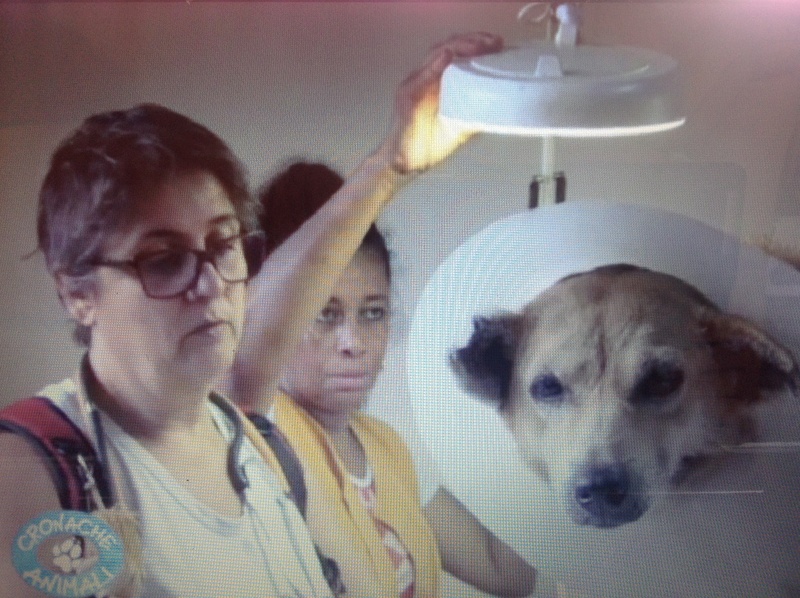 Honey did not take well to her new circumstances and she became depressed. 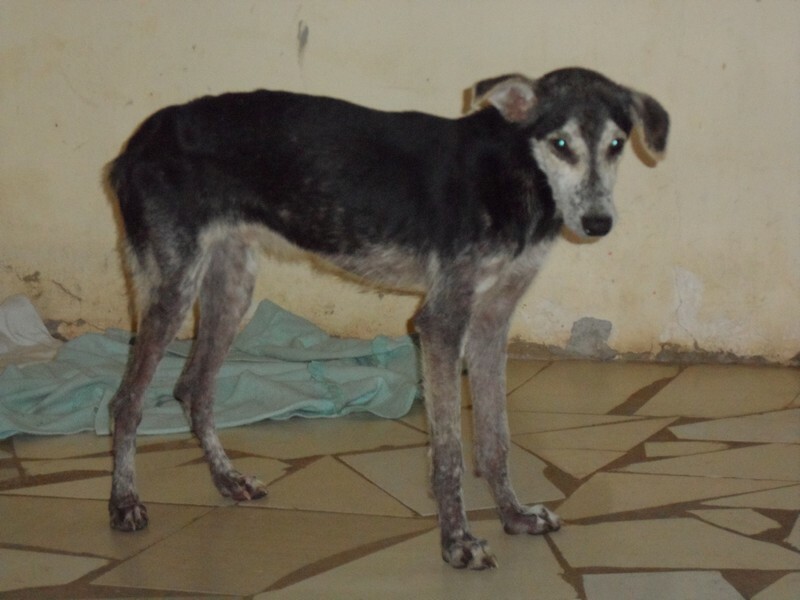 She sat on the concrete floor by herself at the end of the room and refused food and water. Each time someone walked past the window, she looked up to see if it was her daddy coming to collect her. When she realised it wasn’t, she lowered her head into her paws with such sadness that it broke my heart to see the expression on her little face. As the days passed, she slowly began integrating and eating. She had such nice manners it was almost as though she had attended a doggy finishing school. I took her out for a walk every alternate day. When she was on the lead, she trotted along beside me like a little dressage pony, her long coat flowing in the wind. People in the street often smiled at her. And why not? She was adorable. Things were looking good for a while and a potential new owner had been found for Honey. 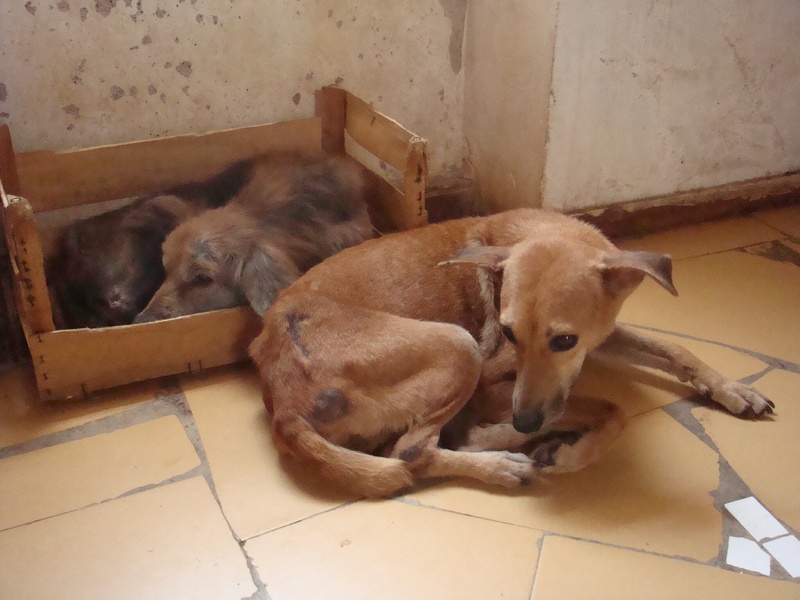 One day, however, I arrived at the shelter to find her lying on the wooden pallet and unwilling to get up for a walk. I took her into the consulting room immediately for observation and treatment. After a few days, she appeared to have recovered and was returned to the puppy room. Less than 24 hours later, though, she began fitting. I couldn’t leave her alone that evening so, when my shift ended, I took her back to La Terrazza. I made her a cosy bed, offered her water and lined up a row of small bowls filled with chicken, fish and biscuits in case she wanted to eat something during the night. 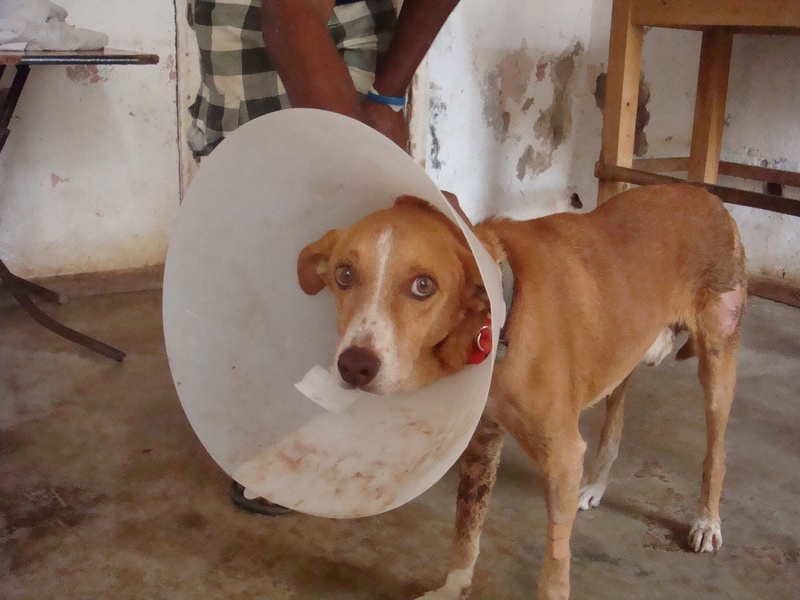 In the absence of any laboratory facilities to confirm a veterinary diagnosis, there is little else to hold onto other than hope. I sat with Honey for hours stroking her silky coat, talking to her – and hoping – but, in the early hours of the morning, she passed away. 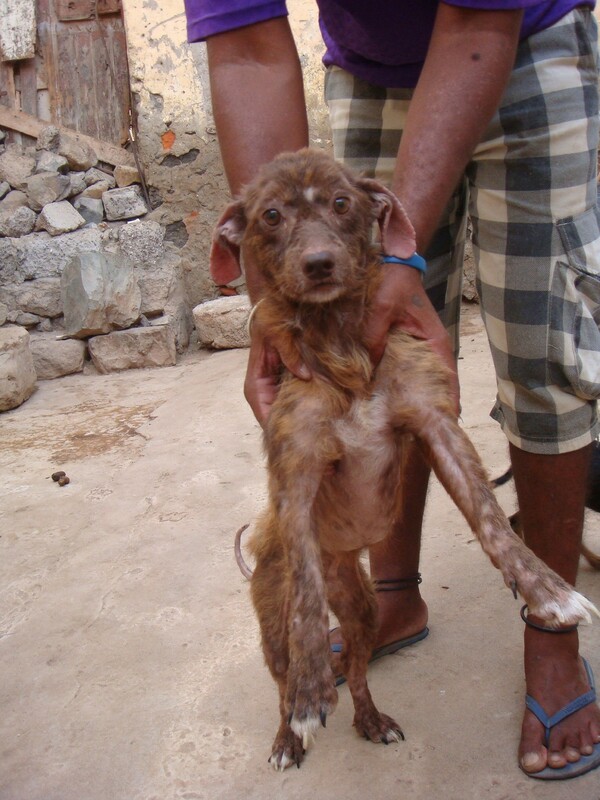 Weeping over the death of one dog in a shelter which houses over 80 could be considered self-indulgent. After all, a weeping volunteer is of little use to anyone. There were, of course, other sad losses during my time there but, when it came to Honey’s death, I felt powerless to apply any discipline or logic to the situation and eventually surrendered to the grief and frustration I felt at her young life being snatched away so unexpectedly. 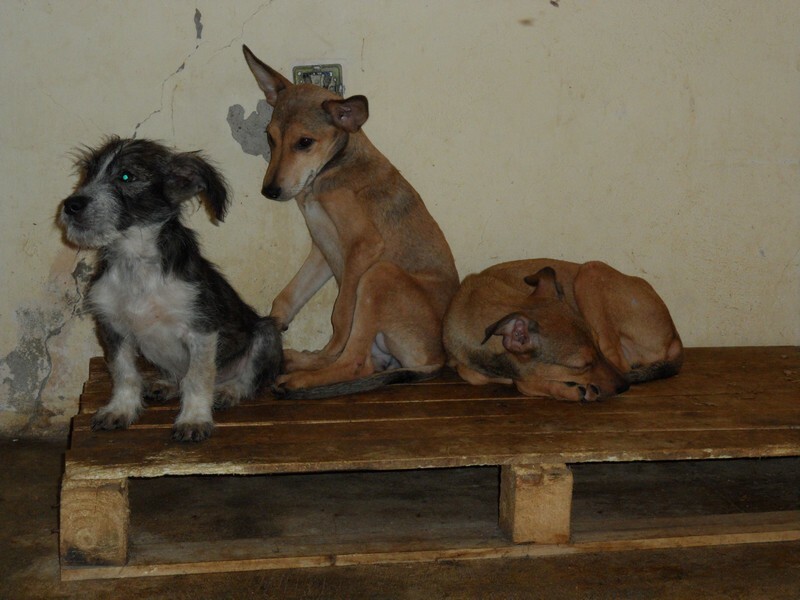 Some of the 80 guests of the shelter. The people of Mindelo, for whom I developed great respect, certainly know how to party. Watching their New Year’s Eve celebrations from the roof at La Terrazza was a thoroughly enjoyable and fascinating cultural experience. The next morning, I decided to walk to the shelter via the main street so I could soak up more of the wonderful atmosphere. 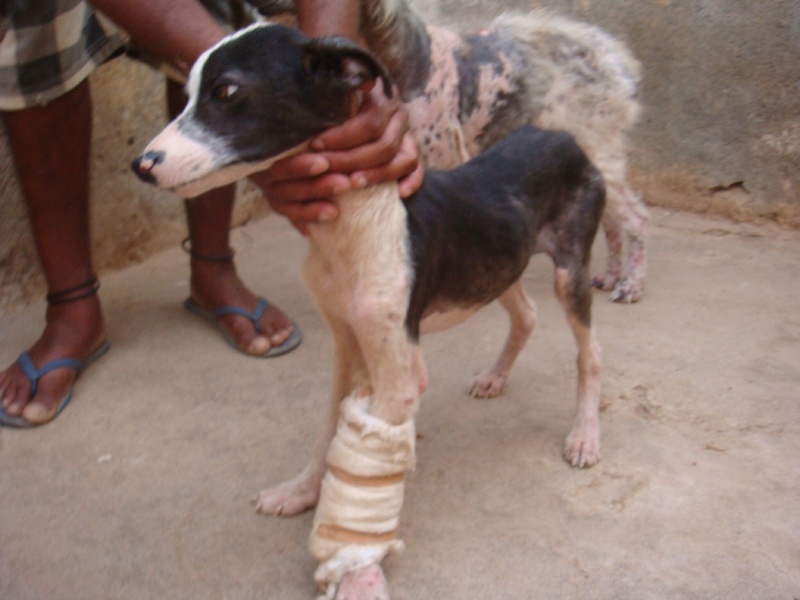 On the way, I spotted a black and white dog on the side of the road swaying and stumbling, barely able to walk. I tried to catch it but couldn’t. 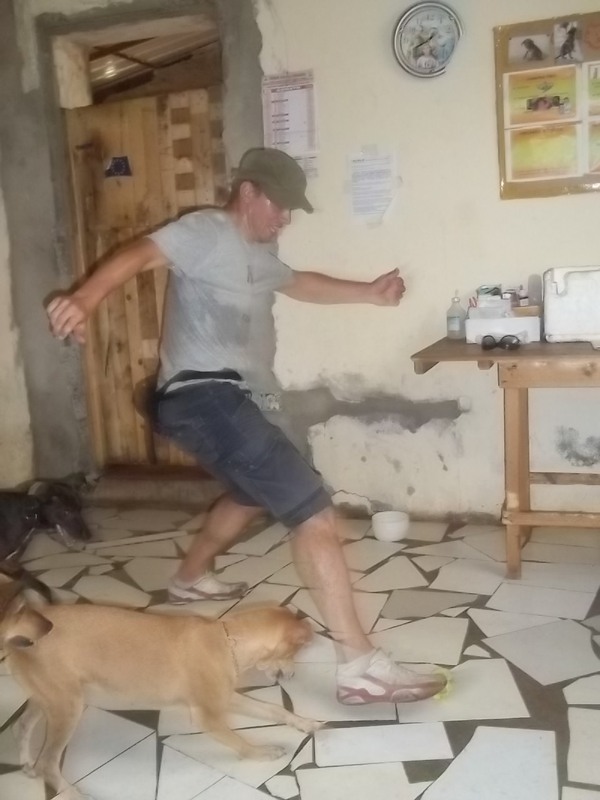 There’s the rub: street dogs are unable to determine whether the person approaching is friend or foe so, even those in a bad way manage to find a spurt of energy to escape. The upshot is that, by the time they are so weak from illness or injury that they can be caught, it is sometimes too late to save their life. Later in the morning, I returned to look for the dog. There was no trace of it so I cut through a gap in the shops and walked up some stairs on my way back to the shelter. I looked down and saw what I thought was a cat curled up on a patch of grass next to the rotting remains of a pigeon wing but, on closer inspection, realised it was the dog. This time, the pathetic bundle of skin and bones offered no resistance whatsoever so I picked it up and began walking to the shelter. 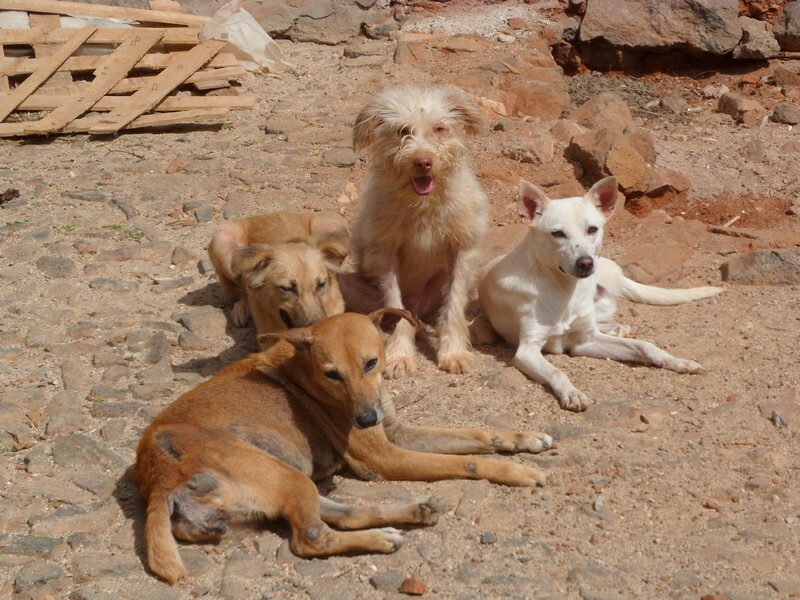 Street dogs are not just at risk from cars, starvation, dehydration and poisoning – they unwittingly host many internal and external parasites. Within minutes, some had decamped from the dog and were scuttling around in my hair and clothes so I was just as anxious to get to the shelter to brush them out as I was to get the dog some veterinary assistance. New Year on the day I brought him to the shelter. 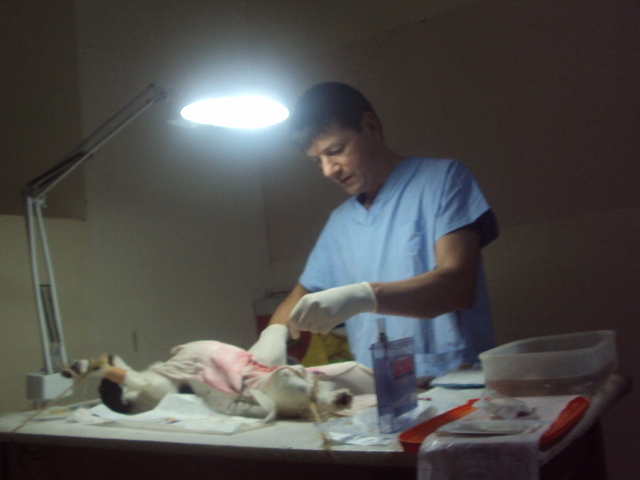 One of the most encouraging aspects about SI MA BO’s philosophy is that all animals are given a chance, no matter how bleak their prognosis. 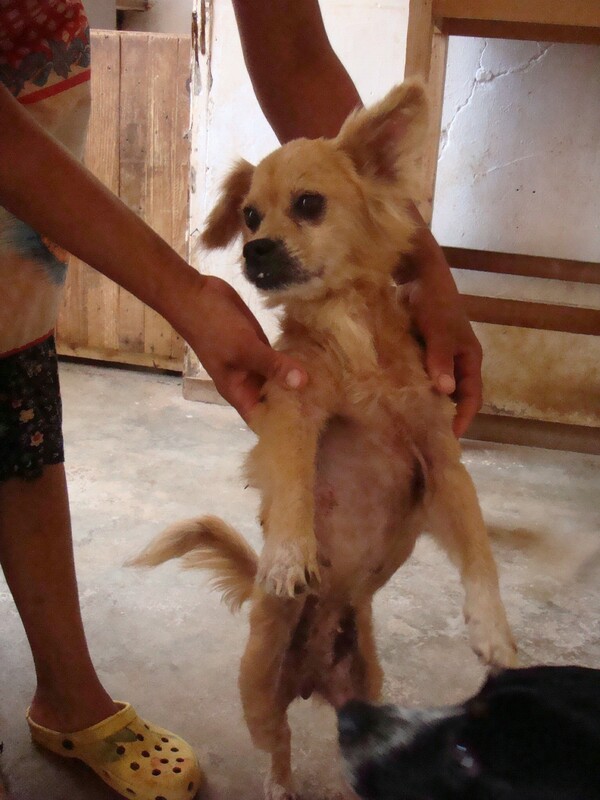 The prognosis for this dog, a male, was uncertain. He should have been bigger than a Labrador but was the size of a cat when curled up. He lay motionless on the examination table while he was being stabilised. I busied myself looking for the thickest, softest towel I could find to support his bony frame on the hard floor. He had to have a name for his clinic sheet, so, being January 1st, Paolo and I decided to call him New Year. Later in the day, he ate a spoonful of food and, the next day, although still too weak to stand, he ate a little more. 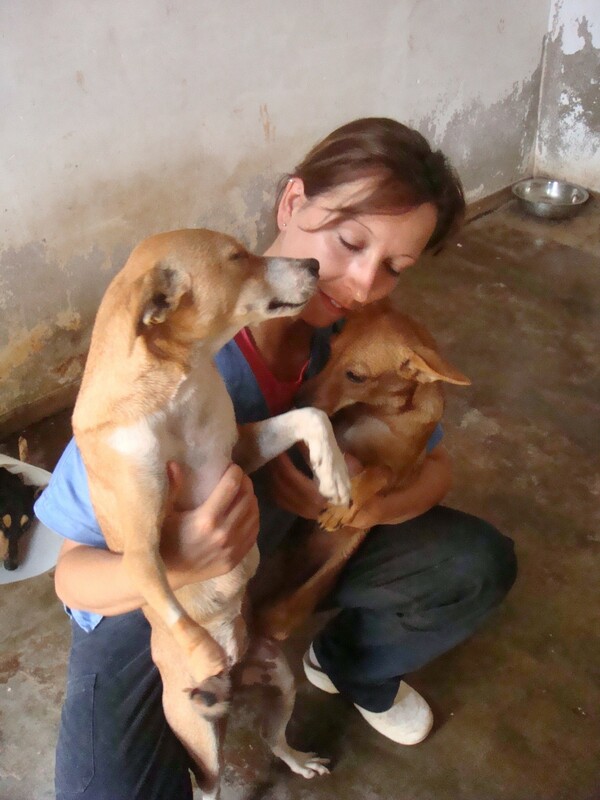 I allowed myself to become hopeful that he might pull through and was reassured by the wonderful veterinary care he received from Roberto and Benedetta, the delightful Italian veterinary surgeons who were volunteering with SI MA BO over Christmas. 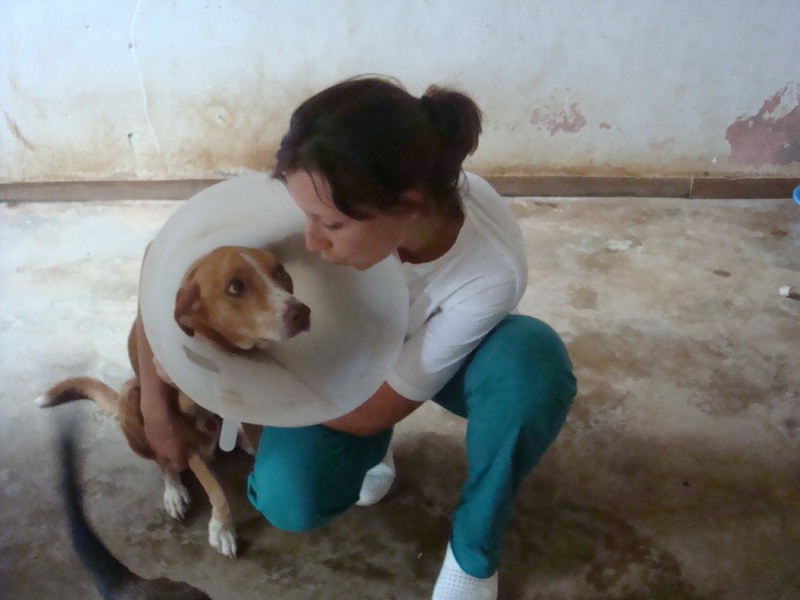 Roberto Rigacci, the Italian surgeon who volunteered wth SIMABO during the Christmas holidays with his wife Benedetta, also a veterinary surgeon. New Year sleeping with Globo, another small dog I rescued from the garden near the big globo standing behind the Palacio do Povo, the nice pink palace where the Portuguese governor used to leave until Cape Verde became independant in 1975. 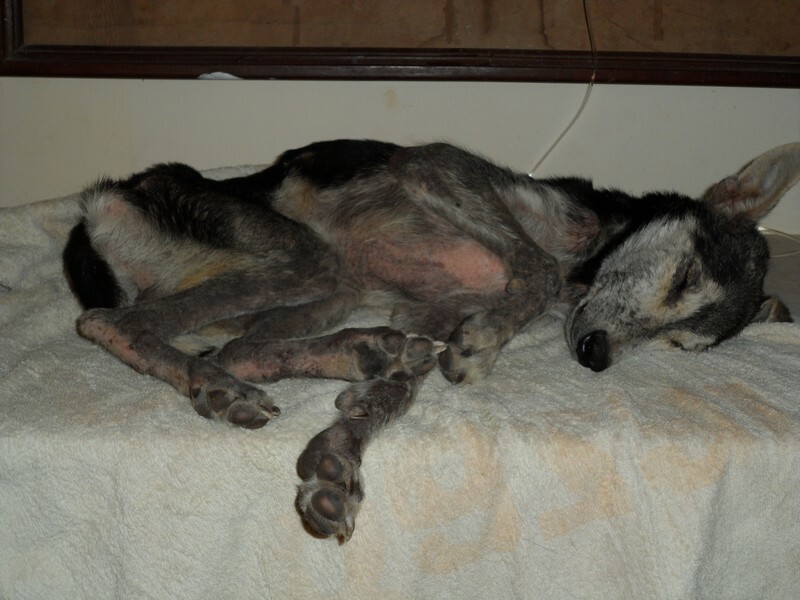 It was obvious that finding a comfortable position to sleep was difficult for New Year not only because he was so thin but also because he had some neurological problems which resulted in a slight bias towards his left. 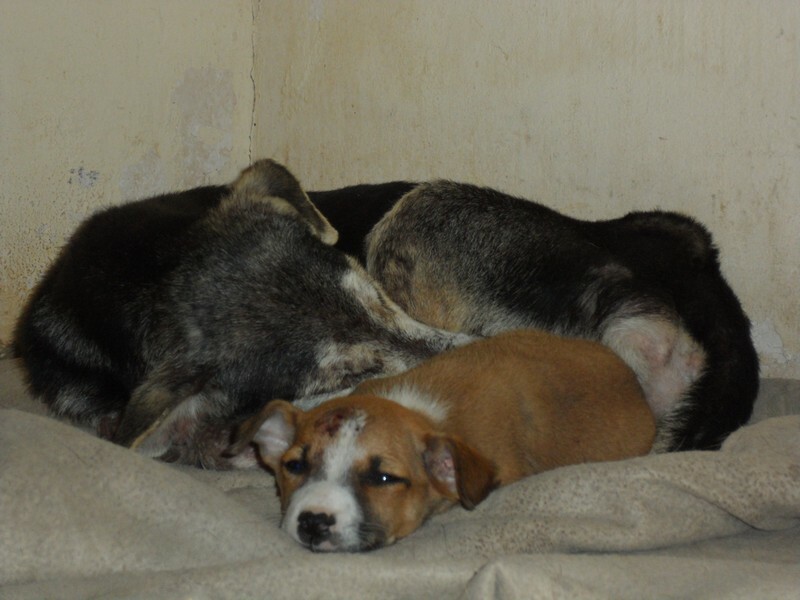 It was particularly touching, therefore, to see him allow puppies to cuddle up with him on his towel after he’d first gone round and round in left-hand circles trying to get comfortable. 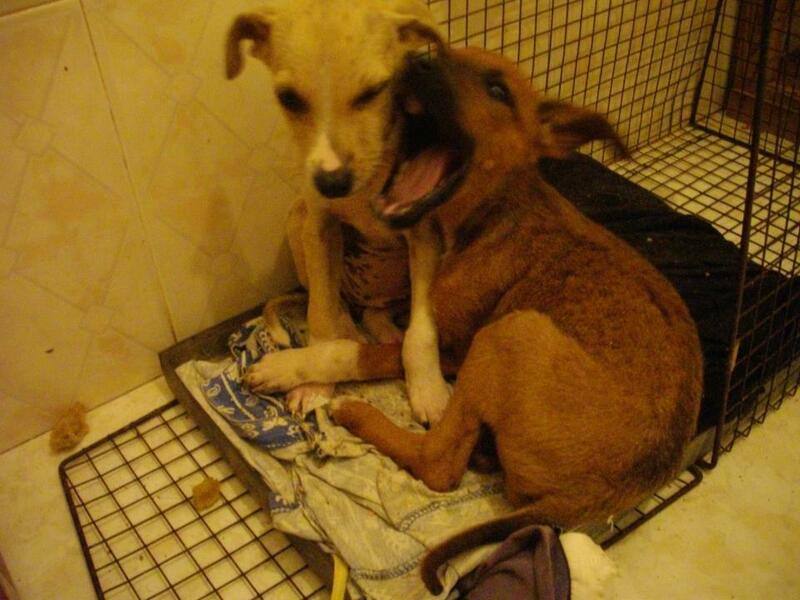 However, he was not so accommodating with the puppies when it came to sharing his food. Woe betide any of them if they attempted to put their cute little nose into his bowl! 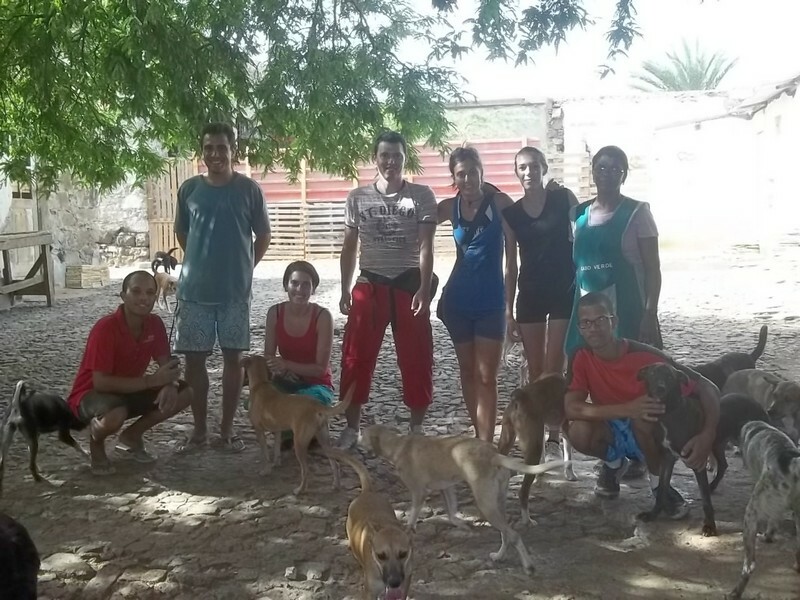 New Year’s health, mobility and socialisation continued to improve. On my last day of volunteering, he was well enough to be let out into the main exercise yard. I got a big lump in my throat as I watched him stand in the middle of the yard taking it all in as though he was saying ‘Wow! This is great.’ before he joined the others for a leisurely stroll in the sunshine. These are just three stories of many hundreds that could be told about SI MA BO animals. The happy endings, which outnumber the sad many times over, fill my heart with joy and optimism. But stories with happy endings can only be told because of the SI MA BO people: the founders, the members, the supporters, the friends, the staff, the volunteers, the fundraisers and the donors. 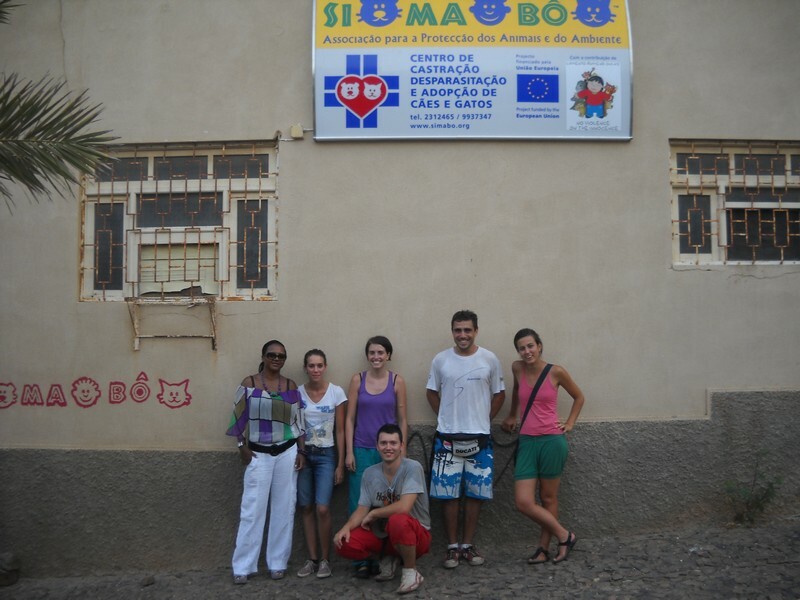 The founders, Silvia Punzo (who I had the great pleasure of meeting a few days before I left Mindelo) and Paolo Manzoni are undoubtedly extraordinary people but they will always need financial and practical support to continue their work. A well- known UK supermarket chain uses an equally well-known catch phrase in its advertising that every little helps. To a UK consumer, that means they could expect to save some money on their weekly shopping bill. 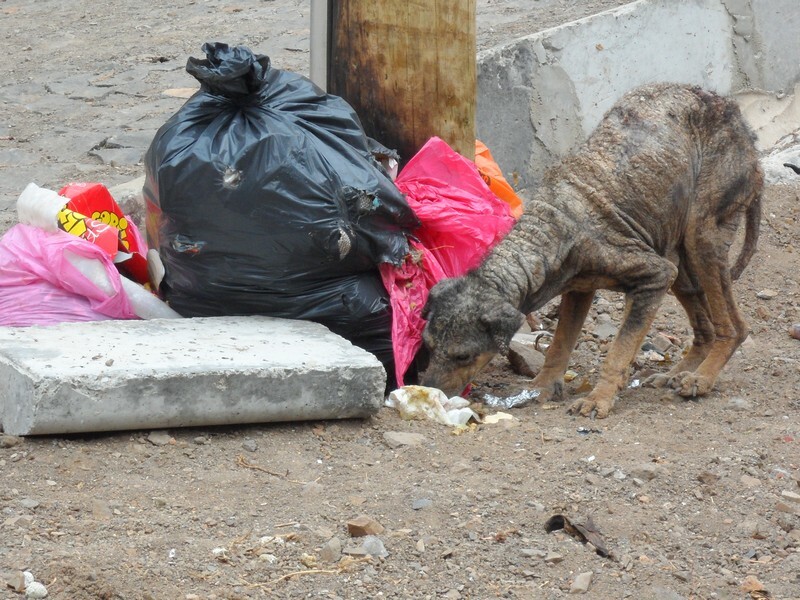 To a Sao Vicente street cat or dog, that could mean the difference between life and death. On my day of departure, the driver arrived early and tooted his car horn to let me know he was ready to take me to the airport. As I left La Terrazza, I frantically searched for Feo and the Espresso Monster. Feo was blissfully ensconced on a rug in the U-bend of a paralyzed dog’s tummy; he had already identified a suitable new ‘pleasure sponsor.’ The Espresso Monster was nowhere to be found but he had already decided his actions at our first meeting were entirely appropriate and fully justified. 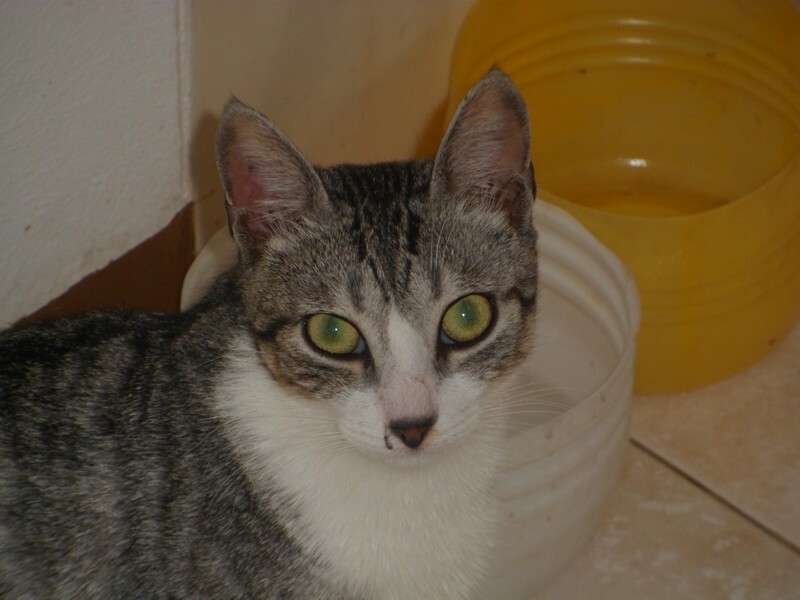 He was one of the kittens that had developed the same respiratory problems as Feo. 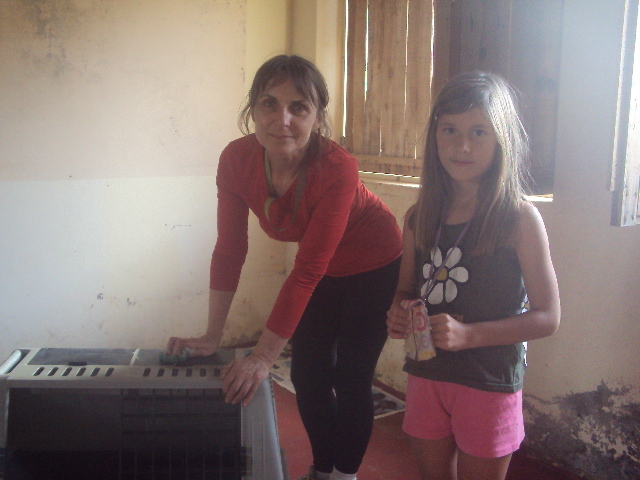 I had helped Martina by fetching, carrying and holding the kittens for their injections and eye drops. The Espresso Monster never forgave me.